As we’re all well aware, Facebook doesn’t offer an iPad app. Well, maybe we’re not all so aware of that. Because Friendly, an unofficial app made by Oecoway, has been a massive hit on the platform. In fact, it has over 500,000 active users, co-founder Cyril Moutran tells us. And that’s pretty amazing considering that they have been charging for the app. But you can probably expect that number to explode even further, as they’ve decided to make the app free. To be clear, there will still be a $0.99 version of Friendly, but the only difference from the new free version is that it won’t have ads. Undoubtedly, most users won’t care about that and will opt for the free version. And the app will rack up even more downloads because 1) again, Facebook doesn’t have an official app and 2) Friendly is a very solid way to use Facebook on the device. “We’re making Friendly for Facebook free, because we want to expand our user base and put Friendly for Facebook in as many people’s hands as possible,” Moutran says. The service essentially takes the touch-optimized version of Facebook’s site and wraps it in their own native app wrapper. 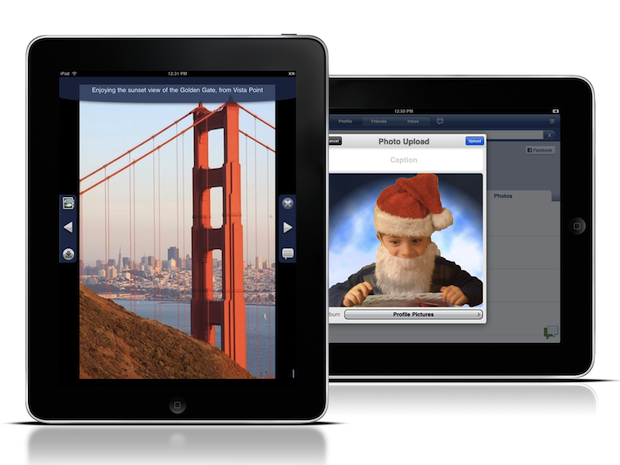 But this allows them to add more functionality, such as the ability to change fonts and colors. 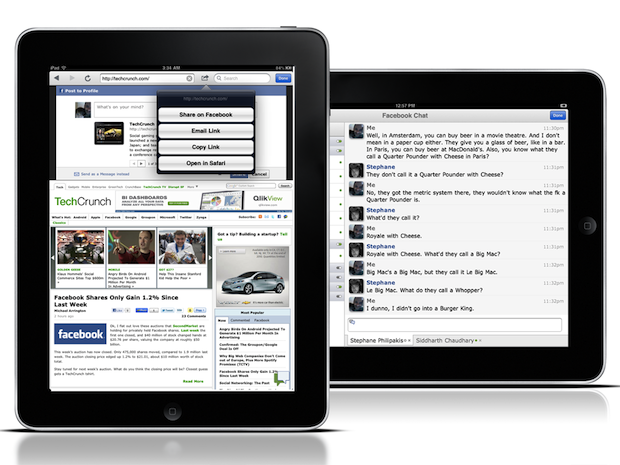 Plus you can browse the web within it and quickly share back to Facebook. You can also easily manage multiple Facebook accounts from the app. The app also brings a native app look, feel, and performance to Facebook. That may not sound like much, but given the usage numbers, it definitely can’t be overlooked. 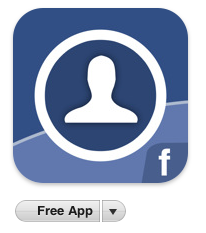 But while Friendly is very good, let’s be honest: if Facebook had their own app, most people would likely use that. People currently searching for “Facebook” on the iPad only have the third-party options — and this has tricked some people. And considering that many of these apps are paid apps, that has cost people money — something which Facebook can’t like too much. So did Facebook pressure Friendly to go free? It doesn’t seem that way. Moutran says that Facebook has been very supportive of what they’ve been doing. “The Facebook Platform team in particular deserves kudos for their around the clock dedication at providing help and guidance to developers on iOS SDK,” he says. Maybe we should take Friendly going free as a sign that an official app is coming? That also doesn’t seem all that likely given Facebook CEO Mark Zuckerberg’s recent words about the possibility. While Moutran declined to talk about their revenue numbers, if you simply take the 500,000 user number and multiply it by the one dollar the app had sold for, you get $500,000 (before Apple takes their 30 percent cut). Of course, Moutran did say the 500,000 is active users, so it’s possible the app has been downloaded quite a bit more, bringing Oecoway even more money. Now they’ll likely have to replace a lot of that money with ad revenue. Will it add up? Who knows, but this move will undoubtedly bring them a lot more users. “We’re really excited because Friendly for Facebook has been an extremely successful paid application. It’s held the top overall spot for paid applications for more than 40 days, and it’s been the top paid social media iPad app since we launched version 1.0. But we want as many people as possible to be able to experience Friendly for Facebook so that’s why we are making it free,” Moutran reiterates. 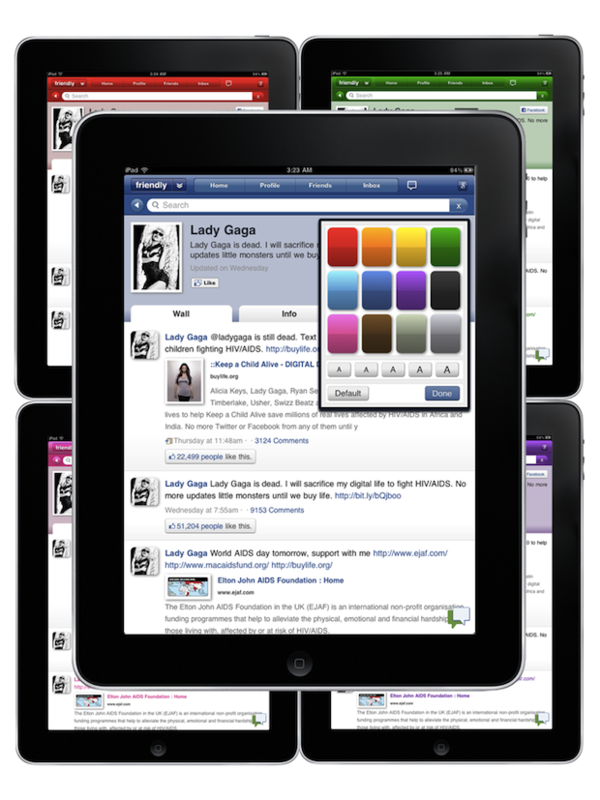 That’s great news for Facebook users and iPad lovers alike. You can find the free version of Friendly here. And the paid version here.